Bob Fulkerson, director of the Progressive Leadership Alliance of Nevada (PLAN), addresses campers at the Legislative building in Carson City Tuesday, May 17. 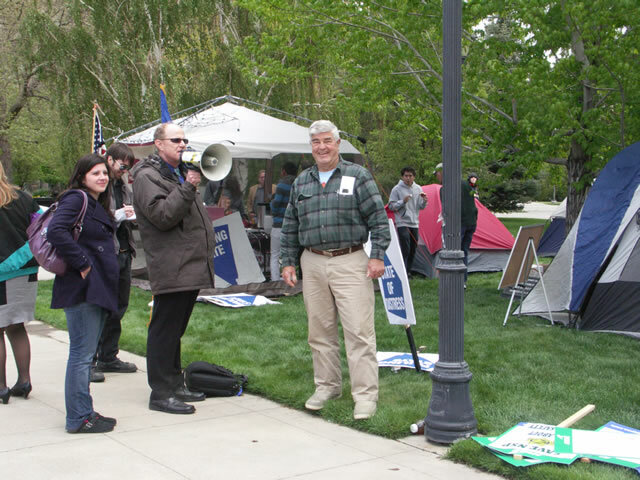 At right is Gim Hollister, former chair of both the Douglas Democratic Central Committee and the Rural Democratic Caucus in Nevada, who set up his tent and joined several organizations camped on the Legislature grounds Monday and Tuesday nights to advocate for the Democratic tax package. This entry was posted in Budget-State, Douglas Dems, Education, Events, Issues and tagged Nevada Legislature, Nevada Rural Democratic Caucus, NVRDC, PLAN, State Budget on May 20, 2011 by NVRDC.